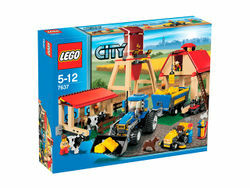 7637 Farm is a City Farm set released in 2009. The set contains 609 pieces to make a grain silo, barn, cow pen, tractor, mower, additional equipment, two cows, a dog, a cat and three minifigures making farmer Brown, a male workhand, and a female workhand. In the Space Police III film The Chase, this farm was hit by a Space Police Officer's ship against the Skull Twins. This is the first LEGO System farm produced to date. This is a description taken from LEGO.com. Please do not modify it. It’s always busy on the LEGO® City Farm! The sun is rising, and it’s time for a brand new day on the farm! The farmer and his helpers get the tractor and trailer ready for the big harvest. Then it’s time to feed and milk the cows, empty the silo for market, and store the fresh hay bales in the barn! Build a barn, cow shed, grain silo, riding mower and tractor with tilting wagon! Includes cat, mouse, 2 cows, dog, farmer minifigure, girl minifigure, farmhand minifigure and accessories! Raise the roof panels on the barn, empty the grain silo, use the winch and hook to move the hay bales or tilt the wagon! Barn measures 6 inches (15cm) tall by 5 inches (12cm) wide; silo is more than 11 inches (27cm) tall!